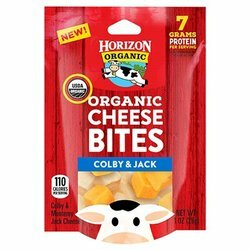 Horizon Organic Cheese Bites - Colby & Jack. The perfect snacking option for when you are hungry but not looking for a sweet or salty snack. Each 1 oz bag has 7 grams of protein and 110 Calories. Item must be kept refrigerated. 7 grams of protein and only 110 calories per bag. Item must be kept refrigerated. Not available for delivery outside the Atlanta delivery area.